I started with the broccoli. The quickest and easiest way to do it is to pop it into a microwave-safe bowl and add a little (couple Tbs or so) of water, cover it and microwave for a few minutes, or until just al dente. Carefully drain the little bit of water off and set aside for a moment. Next, place the butter in a small saute pan over low heat. Once it has melted, swirl the pan constantly and watch for the milk solids to start to turn brown and smell for that nutty, buttery scent. Once it has started to look & smell this way, remove pan from the heat immediately. If it goes farther, it'll just burn and be bitter. Ick. 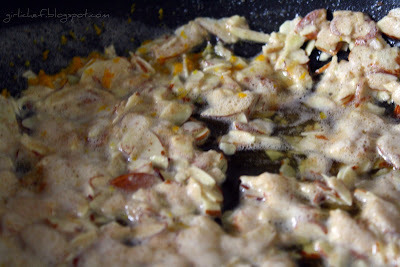 Drop in almonds and orange zest and swirl around. Pour over reserved broccoli. Squeeze the orange half over the whole thing and toss well. Add sea salt to taste. Serve as a side dish or just eat it alone. *Update 12/26/10: I'm sharing this w/ the 12 Days of Bloggie-mas! That looks good, I like broccoli and almonds together. Good luck cleaning out your pantry. I have no idea what to tell you on the anchovies, never use them - probably because dear hubby hates fish or really anything that comes out of water, except salmon, I can get him to eat that. LOL@ chopping broccoli! Too funny girl! Choppin' broco-lay....rotfl. As for the anchovies...ick. But why not ceasar salad....easy enough. As for the phyllo....spanikopita or spinach and feta pie....my fave! I think I will make this tonight but I will have to use lemon zest. I don't have any oranges left since making my cupcakes. The broccoli dish looks great! I love orange with broccoli, I do it in stir fries all the time. As for the phyllo, do you have any cream cheese and berries? You could do a pinwheel or tart kind of thing. I'd mix the anchovies into a chili, tomato sauce or something slow cooking like that. They just melt into it and give it some umami (and salt, heh). I wouldn't use a whole can though, just a couple. I had some broccoli today too, but not as delicious as this one...I did them with oyster sauce. That way of cooking broccoli is amazing, so efficient. LOL! I totally remember that Dana Carvey Special. Still makes me laugh all this time. I've been having a broccoli craving lately. Not sure why I haven't had it yet. I must remedy that, STAT!!! Delish!! as soon as i saw the title for this posting, i was laughing and thinking of that *exact* moment in saturday night live history! But your broccoli looks great! Your broccoli looks really great- I like to put oranges with my broccoli salad so, I know I'd love this! But I don't have a clue about those anchovies! LMAO at Dana video, and thanks for sharing that I had not seen it before! 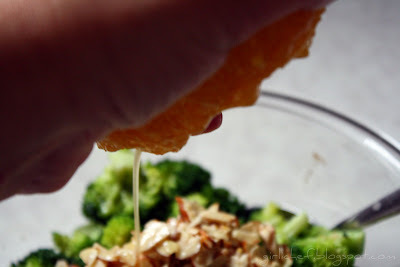 Love Orange with the broccoli in Asian dishes, so this so works for me! How on earth do you find these cute tie-ins? Another great post girlie! Terrific recipe! 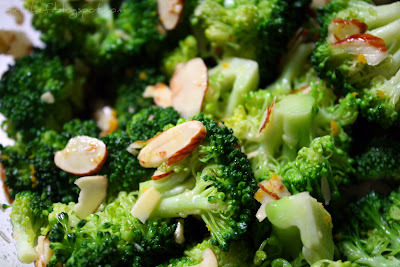 My daughter is not crazy about broccoli but she will eat anything with almonds so I'm definitely trying this. Thanks! I love finding new ways to prepare veggies. This looks delish! LOVE the Dana skit... When I saw the title I kept hearin the song in my head... LOL Awesome Broccoli dish! You had me at "browned butter" As far as Phyllo and Anchovies. Together? That's a tough one. My first inclination is to make anchovy butter to brush the phyllo sheets with, maybe make a phyllo pizza with the stacked sheets? Or make little Mascarpone/Puttanesca tarts with it, in a muffin tin? You are far more disciplined than I am when it comes to cleaning out the fridge/freezer. Since my ultra-picky eating husband is the only one here these days, I find that it is much easier to just toss it out. Oh how I miss cooking for my kids. I can hear the song in my head! lol. This broccoli looks delicious! Really good. Hmmm. Ingredients....maybe make a Ceasar dressing with the anchovies, you can use it for a salad later. And for the phyllo...a pot pie or better yet, baklava (spelling?) I love that stuff! I forgot all about that song--too funny! I am not a huge fan of broccoli but you make it look really good! Loving the Dana Carvey! I'd forgotten about that. The broccoli itself looks terrific. ha ha! Everytime we have broccoli we sing that song. that's hilarious. I am loving your duos of broccoli and butta! mmm! My brothers and I love that dana Carvey kits, we joke about it a lot! One of my brothers is in Iraq right now, see that skit stirred up some good memories, thanks! The broccoli sounds and looks very good. Good save!! Lol! I love your posts Heather. And I have no idea what to do with those things, but will give it some though. heeeey...I was chopin broccoli on sunday! it's one of my fav. veggies...and then you had to add brown butter? and stuff? man....that looks good! ok...so what if you made a caesar salad dressing with the chovies and marinated the chicken....then did a caesar style pastry thing with the chicken and some parm cheese inside the puffs....maybe even throw in a few pieces of broccoli. Make a crust with phyllo dough and top it with puttanesca sauce. You could also make a pissalidere. I've been cleaning out my pantry too. I love it when I find a great recipe that seemingly was "free"! I remember that SNL skit. Yes, we love choppin' brocco-lee too. Great recipe. I love roasting broccoli too, just tossing it with olive oil, salt and pepper and letting those florets get nice and crunchy. Sounds like an awesome combination! I need to clean out my fridge too. For anchovies and phyllo - what about a spanakopita of sorts? Puttanesca style! Got any spinach? You just elevated my most favorite vegetables to a level I never thought possible! Freaking amazing! I remember seeing this exact Dana Carvey comedy special in college. I actually had it on mp3s because I thought his stories of his kids were HI-larious! Help with the song in my head.. The broccoli sounds great with these ingredients.. I love the choppin broccoli! So funny. 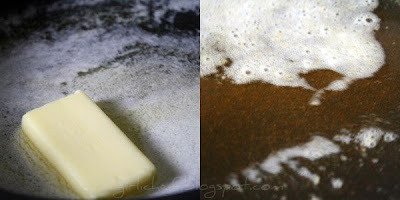 And I love this - especially with the brown butter - so delicious!!! I'm sorry I almost missed this - have out of town company - hard to keep up - but trying my hardest. LOL! Thanks for including Dana Carvey--haven't heard him in ages! Looks great! I love broccoli and prepared this way maybe I can even get other people in my house to eat it! Great way to clean out your fridge! Anchovies melted in butter and poured over broccoli are actually really lovely! The broccoli and almond dish was DELICIOUS. I made it tonight (with a little modification based on what I had on hand) and will blog it in tomorrow morning at http://www.madisonhousechef.com/2009/08/broccoli-and-almonds.html . I found a broccoli recipe!!!! My husband asked for rice tonight. Wouldn't it be good to serve this over the rice and I would make the rice in vegetable broth. Sounds good to me. This is a great recipe. 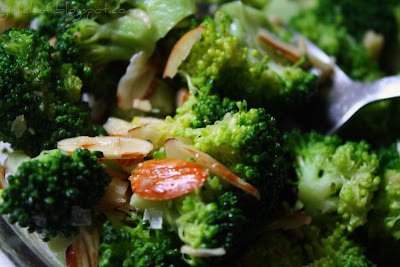 This sounds really lovely - I have never used oranges with broccoli, and although I often used almonds with green beans I never thought of using it with broccoli either. Yum! Hope you are having a very Happy Holiday season!! 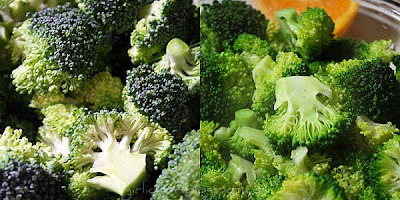 I made your broccoli and posted it on my blog. It was delicious! !